This contact paper is a quick and economical solution to modernize furniture accessories and appliances in your home. Removable peel and stick floral wallpaper roll. Water resistant ,Bubble Free ,this decorative floral contact paper has a peel away backing with measure and grid lines to make it easy for you to create new looks or repairing the appearance of any existing smooth surfaces. 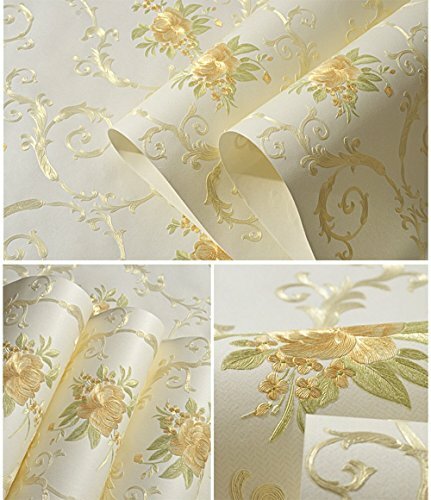 non-woven material ,textured flower pattern ,thick contact paper wallpaper . This self-adhesive wallpaper is easy to cut,instant peel and apply to flat surfaces . If you have any questions about this product by Glow4u, contact us by completing and submitting the form below. If you are looking for a specif part number, please include it with your message.